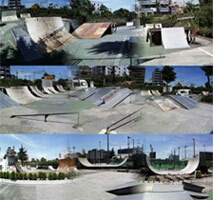 Amazing Square is a Japanese monster of a skate park! Featuring all the amenities of a good park, including a massive half pipe, the park is open 24 hours a day for total skating rapture! Enjoy street skating courses, rails, stairs and more as you skate around Tokyo’s most memorable park.